Spicebomb Extreme by Viktor & Rolf is an oriental and spicy fragrance for men. If you were a fan of the original Spicebomb, this one won’t let you down. The sillage and longevity are better; the scent is more mature with a composition that’s faithful to the original with slightly toned down leather notes. This explosive blend opens up with aromatic lavender enhanced by spicy black pepper and caraway, giving Spicebomb Extreme a masculine and sensual personality. Tobacco notes are strengthened by the sweetness of vanilla in the base; this creates an interesting contrast of intense smoky hints with a more syrupy aroma. Dangerously seductive, this intoxicating fragrance comes in the iconic Spicebomb grenade-shaped bottle in classic black, this time adorned with an orange band in the middle. Spicebomb Extreme by Viktor & Rolf was launched in 2015. A scent that is cozy soft and elegant. My wife loves this one on me. I always look forward to wearing this one outdoors. Great fragrance. What an awesome scent. My girlfriend absolutely adors this scent on me! Hard to find a better one than this for the winter. I love love love this scent. My wife does too,lol. Such a nice cozy scent, a must have for the fall and winter. Can even be worn for the spring. Wow what a scent, just simply marvelous!! A high quality fragrance perfectly suited for the winter. Pick this one up boys!! What a fragrance!! Very cozy, amazing for fall and winter. Can be given as a perfect Christmas gift. 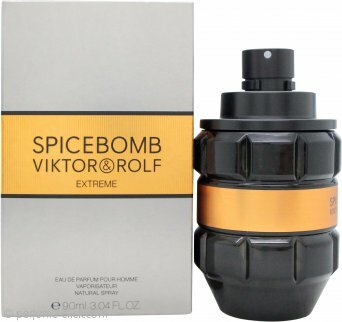 Viktor & Rolf Spicebomb Extreme Eau de Parfum 3.0oz (90ml) SpraySpice bomb cologne. Spice bomb is one the best winter fragrance,I'm talking about the extreme version. A really nice scent. Bought it as a gift for a friend and he’s highly satisfied. So much better than the original. A beatiful gourmand vanilla type of fragrance. Has some nice dpeh to with added spices and tobacco. A truly wonderful cold weather fragrance. A little pricy but deductions worthit. Its got a cozy wintery feel to it. Just love it! The compliment factor on this one is through the roof! If you’re a fragrance collector, this is a must-have! A terrific winter scent. More suitable for casual wear but can be worn slighlty dresses up as well. Spicebomb Extreme is very seductive and masculine, mass appealing, great compliment getter. So happy that to have it in my collection. Will purchase it again after the first bottle. Viktor & Rolf Spicebomb Extreme Eau de Parfum 1.7oz (50ml) SprayKaboom! KABOOM! It's like a spicy sweet but manly super sent. Got to get another bottle ASAP! Highly recommended if you like the original Spice Bomb. I think it's more of a winter fragrance. A very warm and spicy fragrance. Takes the original and adds more depth and power. Spicy oriental winter time fragrance. Extremely warming and comforting, I highly recommend this one. A warming spicey cozy fragrance. Perfume click has been a great place for me to shop for fragrances. A plus Service. Great product! Authentic, package in its original box and cellophone like as if you would purchase it at the mall. Only 4 stars because shipping will take a long time if you're living in the states. A classy mens fragrance. Perfect for the colder weather. You only need a couple of sprays as this fragrance projects really well. the spices are toned down and the vanilla is amped up. a better name for it would be spicebomb vanilla, its sweet and very nice. it doesnt last as long as the original formulation spicebomb, i get about 7 hours and the proection is average. overall its really nice and totally worth buying. This is a wonderful cold weather fragrance. A great option for a gift to give to a family member or friend. This fragrance is best suited for the colder days. Mostly for winter bit can be worn during the fall too. A perfect fragrance for the cold winder days. Extremely inviting and cozy. Smells stronger than the original. This scent is a must have to add to your collection. Good in all season but definitely nice in the colder months. Works in casual or business situations. Purchased and received with no problems. Projects for 3 hours. Lasts easily 8-9 hours on my skin. Sweeter than the original and more wearable IMO. Best suited for fall/ winter night time dates.